It was not supposed to be this way, and yet here it is—the highly regulated monopoly central station generation business model of the electric power industry in place for more than 100 years is being turned on its head by the combination of disruptive technology, disruptive regulation and disruptive global competition. Every new disruption seems to accelerate the process of change. David Crane is no stranger to exploiting disruptive change. He has used it skillfully for years to turn NRG into a competitive powerhouse from its early beginnings as an unregulated subsidiary of Northern State Power in Minnesota. NRG Energy was reborn in 1992 after passage of the Energy Policy Act authorized exempt wholesale power generation in the US markets. These new independent power producers made their early living exploiting the regulatory mandates and loopholes of the day just as renewable energy has done more recently. Using PURPA’s mandate that utilities buy power from qualifying facilities at their avoided cost they build merchant generation typically natural gas-fired combined cycle power plants able to follow load and produce a variety of power products. Later as investor owned utilities divested old power plants as a price for entry into new competitive retail energy markets, these exempt wholesale generators bought them, ‘pimped them out’ to run faster, better and cheaper than the utilities had done and sold the capacity and energy into the market. Later came sale of nuclear power plants for those IPPs qualified to run then, then more recently as renewable portfolio standards, treasury tax grants and other subsidies made renewable energy the only game in town in a depressed, uncertain economy the end game was on. How does China fit into this? Low prices, always low prices from China’s ferocious exports machine able to commoditize solar panels and wind turbines and sell them to eager global markets at prices lower than domestic manufacturers. It was for a while a virtuous circle stimulated by subsidies, lubricated by RPS mandates, supported by environmental advocates as the best thing since canned beer (recyclable aluminum cans of course). The government provided regulations to create the mandates and subsidies to offset the above market costs of compliance. Projects were promoted and helped along by politicians eager to pander and always ready to show up for the press at a green job creating ribbon cutting. Those were the good old days. Today there are storm clouds on the renewable energy front. The air is being cleared and the reality we see is the terror of grid parity and China’s export machine at work suctioning up subsidies and global market share, creating green jobs in China not Boston, and leaving the remnants of a growing renewable energy industry struggling to survive. 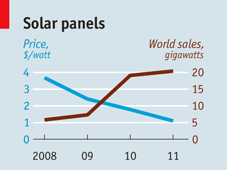 The glut of solar panels worldwide leads the David Crane’s to rethink business models. It bankrupts advanced technology players like Solyndra no longer able to compete in a commoditized PV driven market. It now forces entire nations like Spain, UK and Germany to unravel their feed in tariff policies because they backfired in the face of rapidly falling PV prices. The fear of falling prices is accentuated by that lack of commitment on building better mousetraps. Five of nine of California’s large approved solar thermal utility scale projects are abandoning their challenging molten salt projects replacing the technology with cheap PV panels. The state of California is enabling this because it is more committed to reaching its 33% RPS goal than it is in advancing the real option value of renewable energy technology development. Yes the projects are cheaper, but the switch to PV from solar thermal gives up on energy storage in molten salts. It gives up on improving efficiencies in next generation technology that China does not yet have. It consigns ratepayers to overpaying for rapidly obsolescent technology. It wastes all the R&D effort that US DOE and the California Energy Commission say they are putting into new technology development. It is time to break the cycle of the race to the renewable bottom. 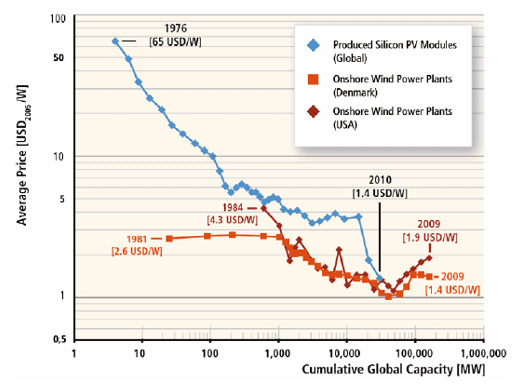 Solar PV is at or near enough to grid parity that we should cease and desist from subsidizing its commodity purchase. Focus tax credits and incentives on the next generation of technology. Focus R&D on improving efficiency and driving down the balance of system costs. Secretary Steven Chu made a big deal of the Sunshot program to drive down the cost of solar to $1 per watt. Guess what? Falling PV prices beat US DOE to that target so why are they still spending money on it. Everything in the renewable energy business has speeded up, but it is often a race to the exits. The unintended consequences of market manipulation whether done by industry to protect monopolies as utilities have done in the past, or by politicians eager to pick winners and losers in an industrial policy roulette with taxpayers’ money, or by export nations like China able to analyze the opportunities and position their export machine to vacuum up money out of the global markets for old technology now made cheap, cheaper and the cheapest ever. The renewable energy industry has a promising future. But that future belongs to the innovators, the new technologies able to drive up efficiencies and performance, drive down the balance of system costs, and position their products to compete head-to-head at grid parity prices with other technologies. Chasing fickle government subsidies or joining the race to the bottom with commodity pricing of the oldest, least efficient technology is not the way to the future we want. It turns renewable energy into a fad and consigns it to the same category as pet rocks! The lesson is the fundamentals driven boom and bust business cycle is alive and well in the globally competitive energy industry and competitive market will not be denied rationalization and the constant search for equilibrium. No amount of market manipulation, industrial policy gaming, or political correctness will stop it. Thank God! Pingback: Low Prices Always Low Prices « Zap! Crackle! Pop!